D iii 9; A ii 5; P i 8; V i 6 (Talwar and Jhingran, 1991). Abraham R (2011a) Oryzias dancena. The IUCN Red List of Threatened Species 2011: e.T172326A6868382. http://dx.doi.org/10.2305/IUCN.UK.2011-1.RLTS.T172326A6868382.en. Downloaded on 17 June 2017. Abraham R (2011b) Oryzias carnaticus. The IUCN Red List of Threatened Species 2011: e.T172401A6884628. http://dx.doi.org/10.2305/IUCN.UK.2011-1.RLTS.T172401A6884628.en. Downloaded on 16 June 2017. Ara SI and Azadi MA (2015) Gobiopterus chuno. In: IUCN Bangladesh. Red List of Bangladesh Volume 5: Freshwater Fishes. IUCN, International Union for Conservation of Nature, Bangladesh Country Office, Dhaka, Bangladesh. p. 222. Chowdhury GW (2015a) Nangra ornata. In: IUCN Bangladesh. 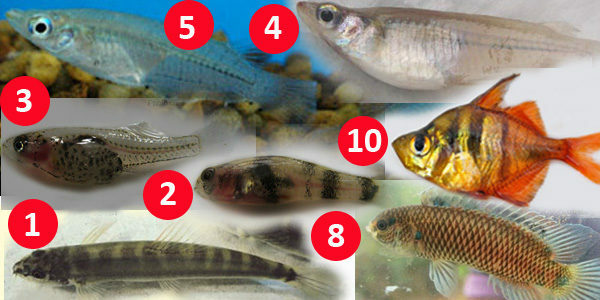 Red List of Bangladesh Volume 5: Freshwater Fishes. IUCN, International Union for Conservation of Nature, Bangladesh Country Office, Dhaka, Bangladesh. p. 310. Chowdhury GW (2015b) Pseudolaguvia shawi. In: IUCN Bangladesh. Red List of Bangladesh Volume 5: Freshwater Fishes. IUCN, International Union for Conservation of Nature, Bangladesh Country Office, Dhaka, Bangladesh. p. 307. Day F (1958) The Fishes of India: being a Natural History of the fishes known to inhabit the seas and freshwater of India., Burma and Ceylon. Reproduced in 1958 by William Dowson and Sons, London, p. 297. Geetakumari K (2012) Parambassis bistigmata, a new species of glassperch from north-eastern India (Teleostei: Ambassidae). Zootaxa 3317:59-64. Hossain MAR (2015) Nangra bucculenta. In: IUCN Bangladesh. Red List of Bangladesh Volume 5: Freshwater Fishes. IUCN, International Union for Conservation of Nature, Bangladesh Country Office, Dhaka, Bangladesh. p. 302. Kullander SO and Britz R (2002) Revision of the family Badidae (Teleostei: Perciformes), with description of a new genus and ten new species. Ichthyol. Explor. Freshwat. 13(4):295-372. Mahalder B and Mustafa MG (2015) Badis chittagongis. In: IUCN Bangladesh. Red List of Bangladesh Volume 5: Freshwater Fishes. IUCN, International Union for Conservation of Nature, Bangladesh Country Office, Dhaka, Bangladesh. p. 299. Mustafa MG, Mahalder B and Ilyas M (2015) . In: IUCN Bangladesh. Red List of Bangladesh Volume 5: Freshwater Fishes. IUCN, International Union for Conservation of Nature, Bangladesh Country Office, Dhaka, Bangladesh. p. 206. Nabi MR (2015) Brachygobius nunus. In: IUCN Bangladesh. Red List of Bangladesh Volume 5: Freshwater Fishes. IUCN, International Union for Conservation of Nature, Bangladesh Country Office, Dhaka, Bangladesh. p. 217. Ng HH (2010a) Nangra ornata. The IUCN Red List of Threatened Species 2010: e.T168534A6510005. http://dx.doi.org/10.2305/IUCN.UK.2010-4.RLTS.T168534A6510005.en. Downloaded on 14 June 2017. Ng HH (2010b) Nangra bucculenta. The IUCN Red List of Threatened Species 2010: e.T168400A6485596. http://dx.doi.org/10.2305/IUCN.UK.2010-4.RLTS.T168400A6485596.en. Downloaded on 15 June 2017. Ng HH (2010c) Pseudolaguvia shawi. The IUCN Red List of Threatened Species 2010: e.T166471A6216340. http://dx.doi.org/10.2305/IUCN.UK.2010-4.RLTS.T166471A6216340.en. Downloaded on 16 June 2017. Ng HH (2010d) Gobiopterus chuno. The IUCN Red List of Threatened Species 2010: e.T168438A6492267. http://dx.doi.org/10.2305/IUCN.UK.2010-4.RLTS.T168438A6492267.en. Downloaded on 16 June 2017. Rahman AKA (1989) Freshwater fishes of Bangladesh. Zoological Society of Bangladesh. Department of Zoology, University of Dhaka. 364 p.
Rahman AKA (2005) Freshwater fishes of Bangladesh, second edition. Zoological Society of Bangladesh, University of Dhaka, Dhaka, Bangladesh. 394 p.
Rahman MM (2015) Schistura savona. In: IUCN Bangladesh. Red List of Bangladesh Volume 5: Freshwater Fishes. IUCN, International Union for Conservation of Nature, Bangladesh Country Office, Dhaka, Bangladesh. p. 121. Rainboth WJ (1996) Fishes of the Cambodian Mekong. FAO species identification field guide for fishery purposes. FAO, Rome, 265 p.
Riede K (2004) Global register of migratory species – from global to regional scales. Final Report of the R&D-Projekt 808 05 081. Federal Agency for Nature Conservation, Bonn, Germany. 329 p.
Roberts TR (1998) Systematic observations on tropical Asian medakas or ricefishes of the genus Oryzias, with descriptions of four new species. Ichthyol. Res. 45(3):213-224. Roberts TR and Ferraris CJJ (1998) Review of South Asian sisorid catfish genera Gagata and Nangra, with descriptions of a new genus and five new species. Proc. Calif. Acad. Sci. 50(14):315-345. Sumaiya A (2015a) Oryzias dancena. In: IUCN Bangladesh. Red List of Bangladesh Volume 5: Freshwater Fishes. IUCN, International Union for Conservation of Nature, Bangladesh Country Office, Dhaka, Bangladesh. p. 277. Sumaiya A (2015b) Oryzias carnaticus. In: IUCN Bangladesh. Red List of Bangladesh Volume 5: Freshwater Fishes. IUCN, International Union for Conservation of Nature, Bangladesh Country Office, Dhaka, Bangladesh. p. 276. Talwar PK and Jhingran AG (1991) Inland fishes of India and adjacent countries, volume 1 & 2. Oxford & IBH Publishing Co Pvt Ltd, New Delhi-Calcutta. 1158 p.
Vishwanath, W. 2010. Schistura savona. The IUCN Red List of Threatened Species 2010: e.T166545A6233668. http://dx.doi.org/10.2305/IUCN.UK.2010-4.RLTS.T166545A6233668.en. Downloaded on 16 June 2017. Visited 1,843 times, 1 visits today | Have any fisheries relevant question? S/He published 27 features. View All.